AirFlow Deflector’s side underride impact guards are the only side underride devices successfully tested by the Insurance Institute for Highway Safety (IIHS) that prevents Passenger Compartment Intrusion (PCI) at speeds of up to 40 mph. This means that AngelWing’s standard has become the generally accepted North American standard. 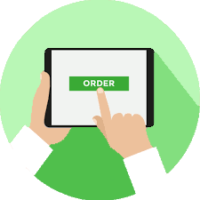 Fleet, OEM or need information? 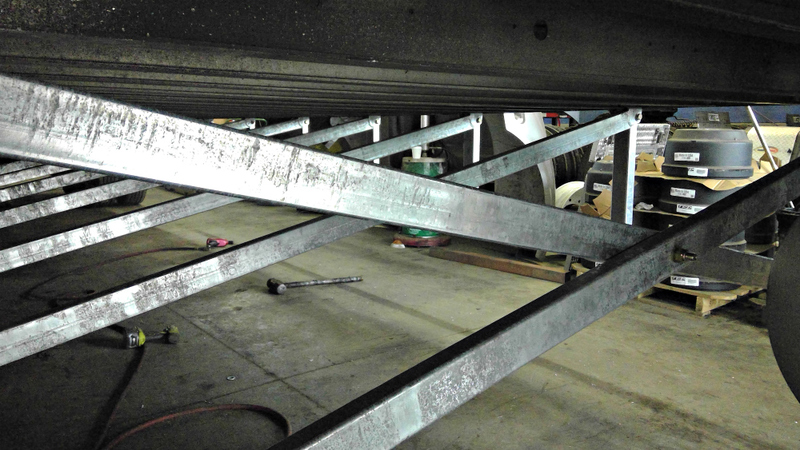 A close-up look at a side guard installed on a flatbed trailer. 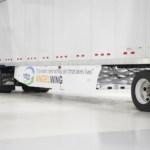 Close-up view of AngelWing’s design on a Utility reefer trailer. IIHS crash test video as presented by CNN Money. 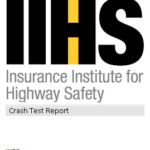 Tests held recently at the Insurance Institute for Highway Safety (IIHS). The first one is a crash with a side skirt and the second is a crash with AngelWing (side underride protection device) and a side skirt. Installing AngelWing in under 2 hours without special tools. Watch what happens when weak side guards are installed. In this case, there were no injuries. 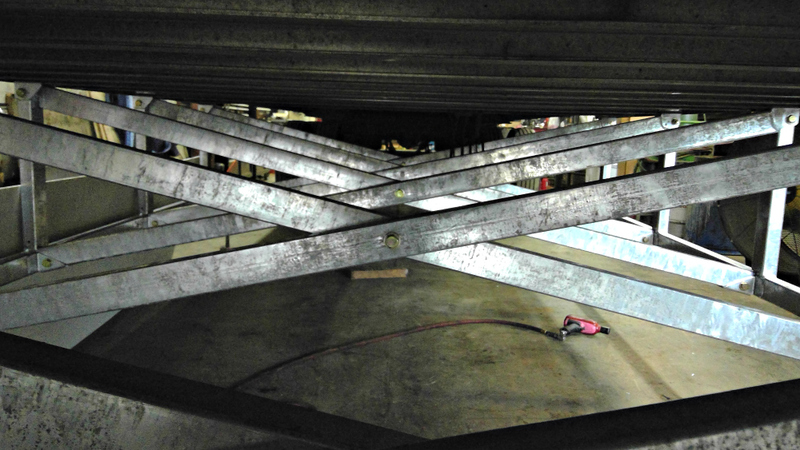 Angel Wing’s Side Underride Device – Bottom view – Cemex USA flat-bed trailer. 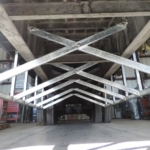 Angel Wing’s Side Underride Device – side view – Cemex USA flat-bed trailer. 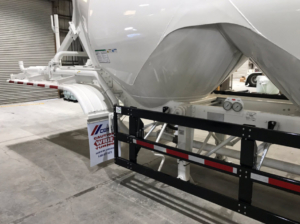 Angel Wing’s Side Underride Device – Cemex USA flat-bed trailer. 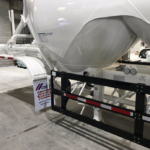 Angel Wing’s Side Underride Device – Cemex USA pneumatic trailer. AngelWing’s Side View before a crash test at 40 mph. AngelWing’s side view after a crash at 40 mph. IIHS Crash test on August 29, 2017. AngelWing’s Dynamic Frame and Structure Design (Front View). IIHS AngelWing Crash Cars on display at the IIHS Testing facilities in Virginia. AngelWing side underride solution with optional composite skirt. IIHS AngelWing Crash Car results without side underride protection. Side underride protection device without a side composite skirt. AngelWIng side underride solution after impact. AngelWIng side underride solution after the impact. Vehicle occupants would have walked away uninjured. Side angel – AngelWing side underride solution. 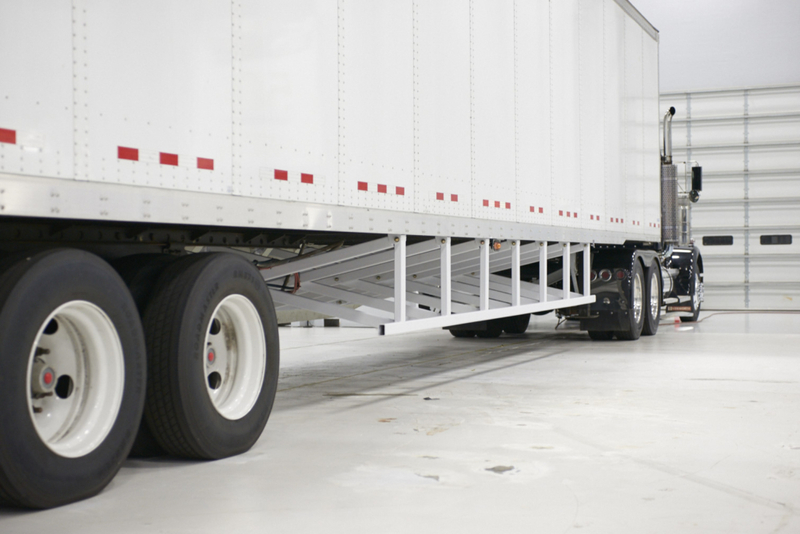 Federal law requires large trucks to have rear underride guards but not side underride guards. At least three U.S. cities, Chicago, Boston, and New York mandate side guards on city-owned and/or contracted trucks as part of Vision Zero initiatives to eliminate crash deaths and injuries, particularly among pedestrians and bicyclists. 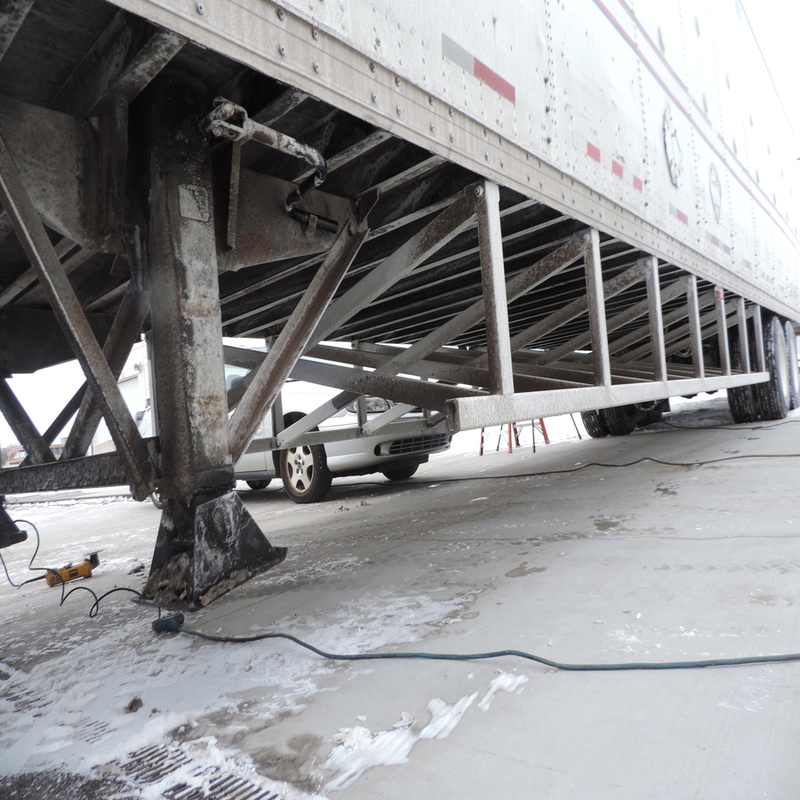 There are currently no side underride laws in place for large semi-trailer and other large sized trucks that share our roads and highways today. Many people believe that that side skirts found on many large transport trucks are in fact side underride protection devices and should a side collision occur between a passenger car and the side of a semi-trailer, this fiberglass skirt would offer protection to the vehicle occupants. 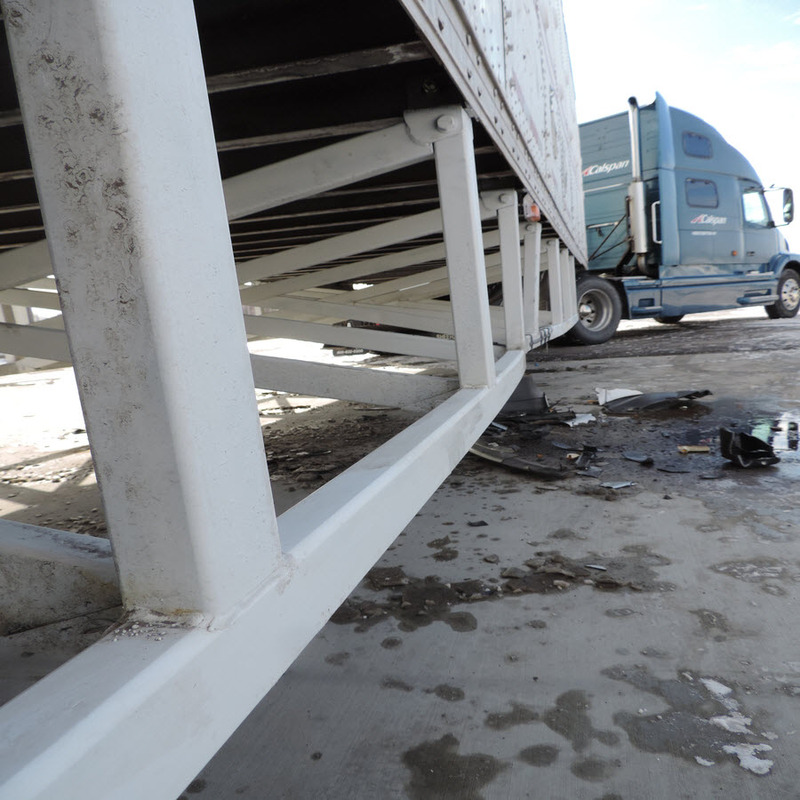 The immense size and weight of large transport trucks can result in devastating results for a passenger vehicle and its occupants should a underride collision occur. According to NHTSA data, 73% of all fatalities in a truck accident in 2014 were the occupants of other vehicles. In 2015, White House and DOT issue call to action to data scientists and public health experts as 2,348 more people died in crashes than in 2014. As the number of truck crashes and the resulting injuries and fatalities continue to rise, addressing truck safety issues is integral to making our highways safe again. In 2015, 4,067 people were killed in crashes involving large trucks, representing a 20 percent increase from 2009. This is the first time truck crash deaths have exceeded 4,000 since 2008. Further, early release data for 2015 shows that there were 415,000 truck crashes, which resulted in 116,000 people injured in crashes involving large trucks — an increase of 45 and 57 percent since 2009, respectively. The annual cost to society from crashes involving commercial motor vehicles is estimated to be over $110 billion. What is a side, rear or front underride crash? 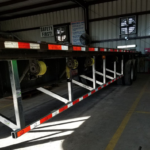 Few truck accidents are more destructive than those that involve a passenger car which gets lodged or pinned underneath a large transport truck. 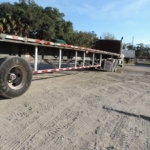 The tractor trailer bed is often higher than the hood of a standard vehicle which when a side, front or rear underride crash occurs, the car goes partially or completely under a truck or trailer. This significantly increases the chance of severe injury or death as most safety accessories and devices like airbags, anti-avoidance technology, and other type equipment are rendered ineffective because of the difference in heights between transport trucks and regular passenger vehicles. 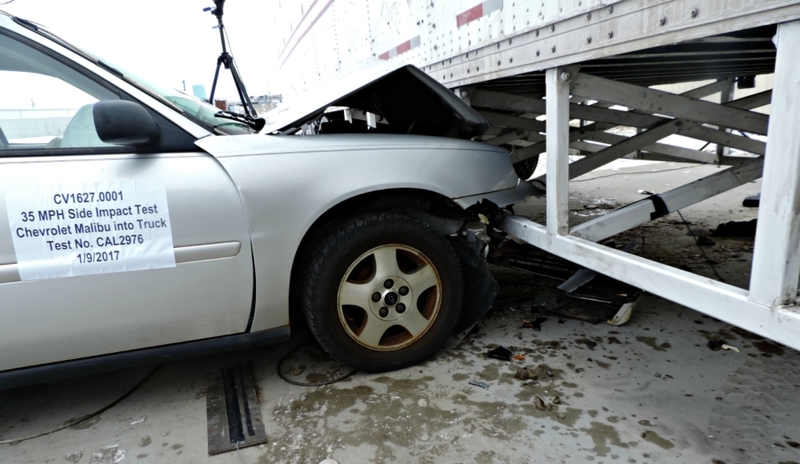 Recently the IIHS wanted to see what differences there were when a vehicle crashes into the side of an unprotected semi trailer/ The test was set to evaluated a side underride guard crash at 35-mph. One test crash involved a mid-sized vehicle and a semi-trailer outfitted with a typical composite side fairing side skirt intended only to improve save fuel and aerodynamics. 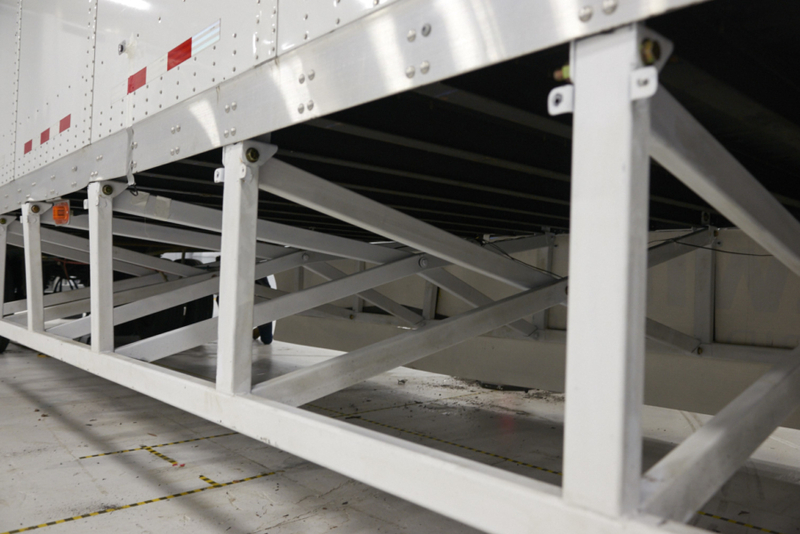 The second test involved a mid-sized vehicle and a semi-trailer outfitted with a typical composite side fairing skirt and a side underride protection devices (AngelWing). Although the crash specifications were similar (trailer, speed and vehicle type), the results were dramatically different. 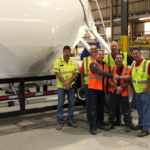 As seen in the video shown on the previous section, the two tests involved a midsize car striking the center of a 53-foot-long dry van trailer. 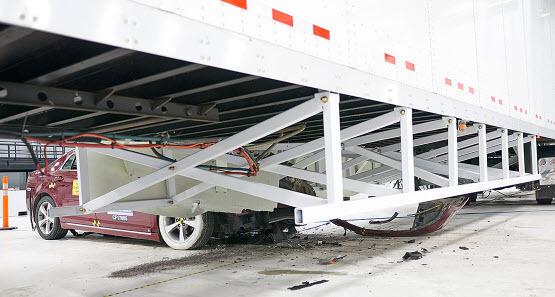 The difference between the two tests was that the crash with the side underride protection device (AngelWing) didn’t allow the car to penetrate the underride and go underneath and strike the trailer. 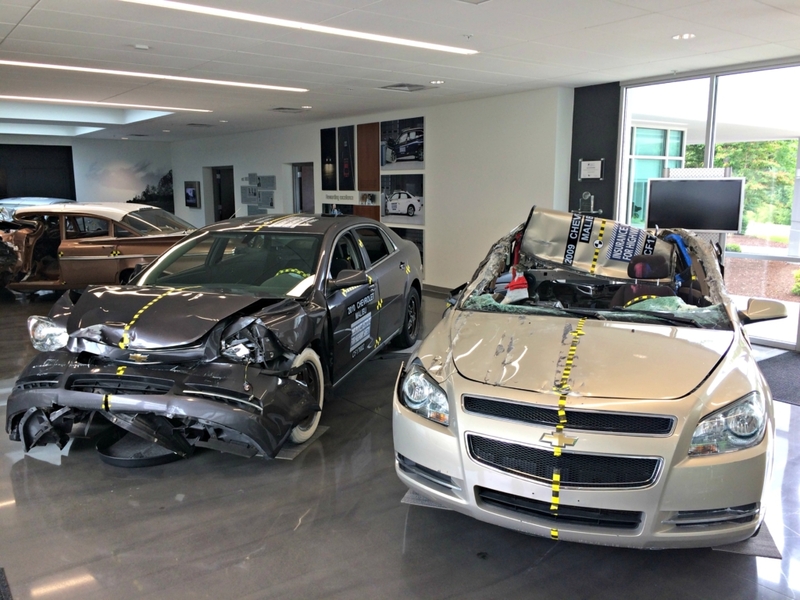 The end result was that the vehicle’s safety devices (air bags, safety belt, and crumple zones) could properly restrain the test dummy located in the driver seat. In the second test, with only the side fairing skirt and no side underride protection device, the car traveled underneath the trailer, slammed into the windshield and impacted the side of the trailer. If the semi-trailer was in motion, the car could have possibly flipped the trailer, come into contact with the rear wheels, or both, risking the life or the semi-trailer occupants as well. 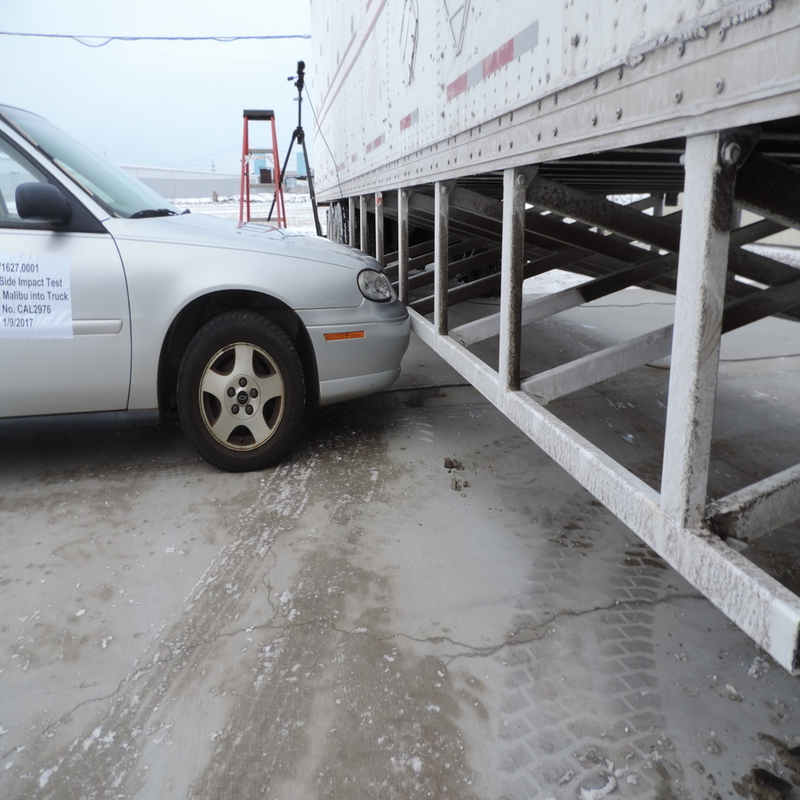 The resulting impact sheared off part of the roof, and the vehicle became wedged beneath the trailer. 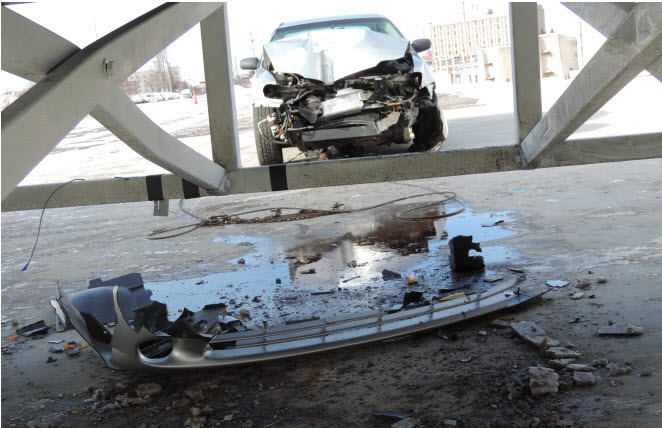 In a real-world crash like this, any occupants in the car would likely sustain fatal injuries. 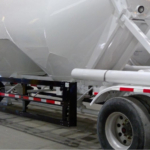 In summary, trailer fairing skirts are specifically designed to control the flow of air underneath the semi-trailers and reduce fuel consumption and not engage safety features of vehicles such as airbags, crumple zones or anti-avoidance technology (if equipped). 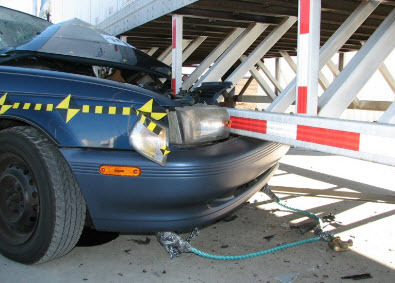 Should an impact occur, the car will breach the skirt and travel underneath the trailer and passenger compartment intrusion (“PCI”) will occur, possibly causing life-altering injuries or death. How do truck side guards work? 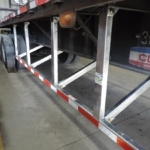 Truck side guards or Side Underride Protection Devices are attached directly to the cross member of the semi-trailer body at specified intervals. 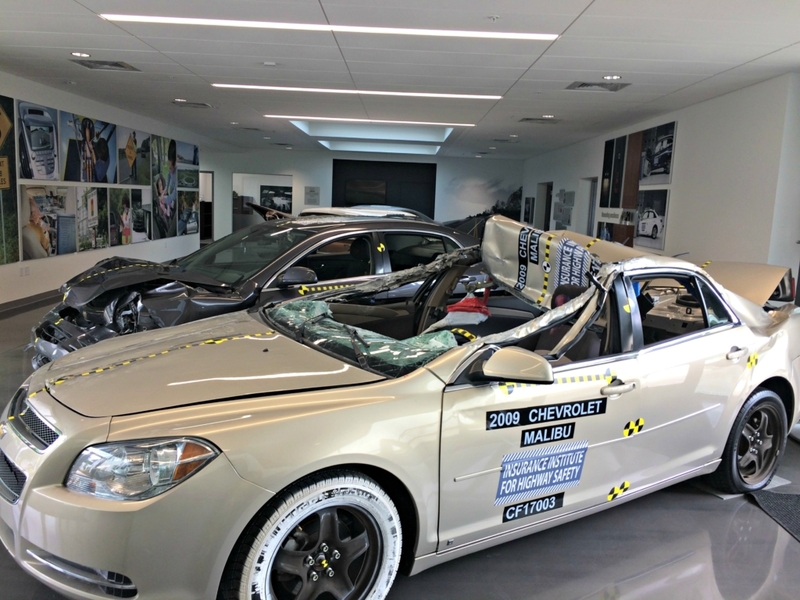 Upon impact, the structure engages and deploys the vehicle’s built-in safety features such as airbags, anti-avoidance sensors, crumple zones or seat belts, designed to protect its occupants from possible injury or death. The end result is that the side underride protection device provides a stable structure which prevents the car from traveling under the trailer and engages the safety features of the vehicle. This combination protects all vehicle and truck occupants should a side collision occur. Do I need to replace my fuel-saving, side fairing skirt? AirFlow Deflector Side Guards are designed to work and integrate with most fuel saving side fairing skirts available in the marketplace. The end result is that users can maintain their current fuel efficiency levels and SmartWay™ certification (if applicable). 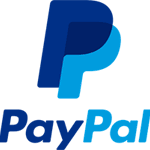 Should a fuel savings skirt be needed, we work with most companies or one can be supplied through AirFlow Deflector. Please contact AFD or your dealership for further details.